Birding the Niagara Frontier. You must have a passport or a passport card to enter Canada and return to the US. We will bird mostly in Canada. This four-day trip will cover Dunkirk Harbor en route to the Peace Bridge as well as areas along the Niagara River and Lake Ontario. We plan to stay at either the Best Days or the Super 8 near the falls on the Canadian side. You may take part in the entire trip or in only a day or two by meeting us there. If you are interested in going or have questions, please contact the Higbees (724-354-3493). Last year's Niagara highlights included Brant, King Eider, all three scoters, Purple Sandpiper, Little Gull, Franklin's Gull, Thayer's Gull, Iceland Gull, Lesser Black-backed Gull, and Northern Saw-whet Owl. For a complete report, go to our web site http://toddbirdclub.org/cgi-bin/events.pl?ACTION=DESCRIPTION&EVENTID=123. Friday, November 29, 2013  Ian Haigh arrived promptly at 5:45 this morning to take part in our Niagara trip. We left the driveway around 6:20. The temperature this morning was 24o. We left the park at 10:14, and not too far outside the park we spotted a Merlin. At the Grimsby Welcome Center where we met Frank and Sandra Horvath, we found Common Loon, Ring-billed Gulls, and Rock Pigeons. 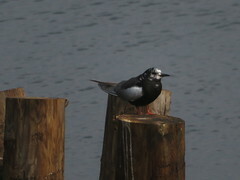 We left Fifty Road and drove to Fruitland where we saw the same species but also added Black Scoters and American Robins. DeWitt Road was our next destination, but there were few birds here, just Ring-billed and Herring Gulls. We continued to Millen Road where Roger spotted a Northern Harrier flying far out over the water. It continued to fly toward us and started working the fields to our left. Frank also spotted the Orange-crowned Warbler here. We started heading back to search again for the King Eider. We followed Frank back to Fruitland. We saw quite a few birds at Fruitland, many of the same ones wed listed earlier. Just as we were making plans to try one of the other roads, I spotted the beautiful female King Eider. What a great ending to a good birding day! We walked upriver to the location where wed had the Franklins Gull last year. The same gulls were present here, but we added 3 American Robins and a Northern Mockingbird. We followed the OFO group to the Horseshoe Falls gorge where we found two Black-legged Kittiwakes flying together toward the fog. Within seconds, they emerged and continued to circle right below us. We decided to head to Queenston before it got too dark to see. We arrived at 4:05. Here were many fly-by Bonapartes Gulls. One *Little Gull was circling over the water farther downstream. We all had excellent views. The only other birds found here were Ring-billed and Herring Gulls plus one Belted Kingfisher. Our trip total was 84 species.